In 2008 the JRPG market started to feel like it had stagnated. Beyond some now familiar outliers like Fire Emblem, gamers weren’t being given new experiences. Then Square Enix, the company most known for relying on old RPG gaming conventions, flipped it around and let loose its modern and complex take on Tokyo and society. 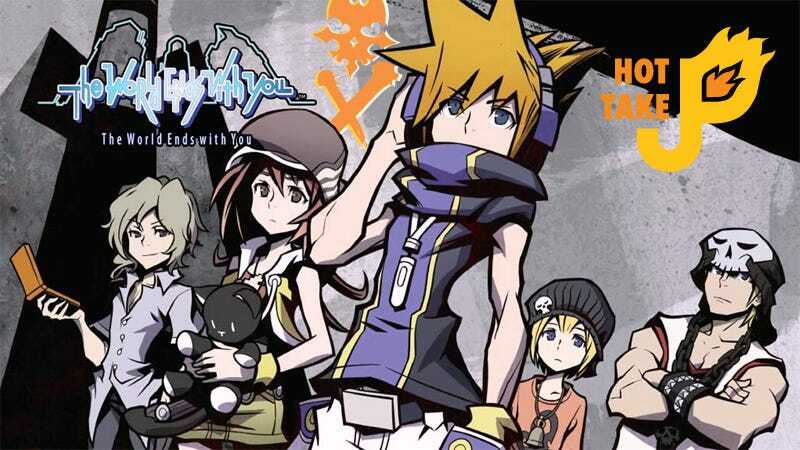 The modern JRPG world re-started with The World Ends With You. The premise is convoluted and the themes border on cliché, but after you spend some time with the characters you’ll start to love ‘em. Neku, the main player character, was never the star in my eyes. There are so many fun side characters and villains that I’m not sure why anyone would think he is. The game’s audio and visual aesthetic haven’t been replicated since its release. I fell in love with the music in my first play-through years ago, enough to download the album so I could listen outside of play. That’s still the case. It’s still fresh and interesting despite being much more hip-hop/pop inspired. The World Ends With You embraces complexity and difficulty, but made sure to provide plenty of options for varied gameplay levels. The battle system in particular, which uses both d-pad and touchscreen, can be quite a beast. But once you tame it you’ll be passing the in-game puck between characters with ease. A level slider eases casual players into the groove, and conversely turning up the difficulty and linking more battles means more pin drops and experience. Outside of the battling the game is jam PACKED with features and mechanics. The way that it used the the DS’s other features were (at the time) novel. It uses the internal clock to award experience for time you aren’t playing and even has a primitive form of Nintendo’s current StreetPass system. Fashion and eating are huge factors in how you play as well, each contributing differently to stats and experience gain respectevily. There’s even a pin winning mini-game that isn’t actually that interesting, but it’s there. The World Ends With You is a masterpiece of the DS era. Despite its intense complexity, it’s still a ton of fun and I can’t recommend it enough. You can find it for a reasonable price on Amazon, but if you’re looking for more immediate play there’s an iOS version available that I hear is pretty good. Be sure to try it out.